To begin 3D modeling in progeCAD it is important that you are first familiar with the basic progeCAD or AutoCAD 2D drafting operations. This tutorial extends the principals established in 2D for creating 3D models using progeCAD and is to be used in conjunction with the progeCAD manual and progeCAD Help accompanying your software. Many techniques established here may also be used in standard AutoCAD or some versions of basic IntelliCAD. It is important to be able to orient yourself in 3D space. Drawing in 3D is essentially the same as drawing in 2D as the commands are the same. The only difference is that you use the z component in the Cartesian coordinate system along with the x and y components. So the origin would be: <0,0,0>. You also have the option using your View toolbar to set the view to different orthographic or isometric views. Before starting you should open some additional toolbars which will be very useful when working in 3D. These can be accessed by going to View > Toolbars and this should open up a window called â€œSelect Toolbarsâ€� and you can tick the boxes to add the following toolbars. These should then appear on your workspace and you have the option to move these floatable toolbars and dock them in the anywhere in the standard toolbar area. Â· Enable a one-time entity snap for a single selection by choosing an entity snap when no other command is active. You can also use a one-time entity snap to override a running entity snap. To enable the ESNAP function you can open the Object Snaps toolbar and select one of the snap tools or go to Format > Entity Snaps and choose the entity snap from here. All progeCAD drawings use a fixed coordinate system, called the World Coordinate System (WCS), and every pointy in the drawing as a specific x,y,z- coordinate in the WCS. You can also define arbitrary coordinate systems located anywhere in 3D space. These are called User Coordinate Systems (UCS) and can be located anywhere in the WCS and orientated in any direction. You can create as many user coordinate systems as you want, saving or redefining them to help you construct 3D entities. A wireframe model consists of lines and curves that define the edges of a 3D entity. You can create a wireframe model by drawing lines, arcs, polylines and other 2D entities anywhere in 3D space. Think of them as being the skeleton of a 3D object which means they have no surfaces. Because you must individually draw and position each entity that makes up a wireframe model, creating one can often be very time consuming.Â Hereâ€™s a basic example of a 3D wireframe cube model that was created in progeCAD using ESNAPs to join up opposite corners with diagonal lines. Now create any 2D shape and these values will be applied to it automatically. Here is a square using the rectangle icon from the Draw toolbar on the left hand side of your workspace. To change the view go to your View Toolbar and from the default Top view to a SE Isometric view. This will show you the applied elevation and thickness of the shape. To modify the properties of this entity go to Modify > Properties it will ask you to select the entity you wish to modify and an â€œEntity Propertiesâ€� window will open and you can change the properties as required. Click â€œOKâ€� to accept changes and your image should be updated automatically. You could also use the specific three-dimensional entity-creation commands to speed up the process. From the Surfaces Toolbar select the Wedge icon. Start by drawing the rectangle base for your wedge, once completed it will ask you to specify the height of the wedge also. You have the option of entering the values manually into the command prompt. To view your wedge you may wish to change the view to SE Isometric. 3D solids, which are three-dimensional ACIS entities that consist of faces and edges. 3D solids appear to have volume and are easier to work with than wire-frame and surface models. progeCAD supports viewing and editing of 3D solids, including moving, rotating and scaling. It should be noted that, as with AutoCAD, progeCAD 3d solids can only be constructed from either closed solid-linetype polylines or spline profiles. The easiest way to create a basic solid is by using the Solid toolbar . Select the cylinder icon and specify the radius of the circle and the height for this cylinder. Ensure ESNAP is on and create a second cylinder of smaller radius circle inside the first circle and specify the same height for this cylinder. Now using the Solid Editing toolbar we are going to use the subtract icon to create a cylinder with a hole in the centre. To view this subtraction you can use the 256 Colours icon option from the Shade toolbar. 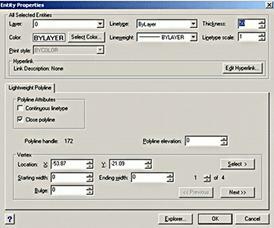 To further edit this 3D entity select the Â fillet icon from the Modify toolbar on the right hand side of your workspace. This function will allow you to smooth corners and edges. Repeat this step with the top inner edge of cylinder choosing a smaller fillet radius. The difference between wireframe models and surface/ solid models is that surface/ solid models they can be shaded and rendered. This gives that final touch to your 3D model by adding colour, texture or lighting to create a realistic image. These functions can be accessed using the Shading toolbar and the Rendering toolbar.